As a Clemson alum, there are many ways you can show your love and affection for Clemson at your wedding without having an orange and purple wedding. There are many traditions that have been carried along over the years by Clemson alums at weddings that you can incorporate in your own wedding. 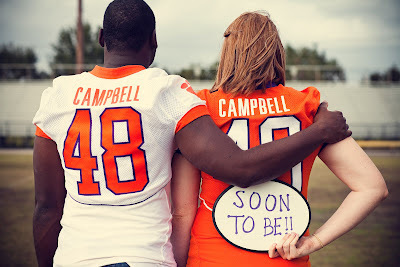 Take Clemson themed engagement photos. View Alexandra and Jeremy's engagement photos post. Etsy listing for this garter. 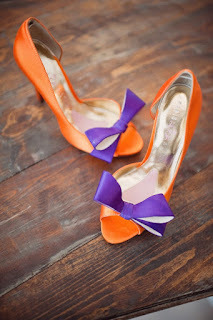 Wear bright Clemson orange and purple wedding shoes. Read our entire 'Clemson wedding shoes' post. 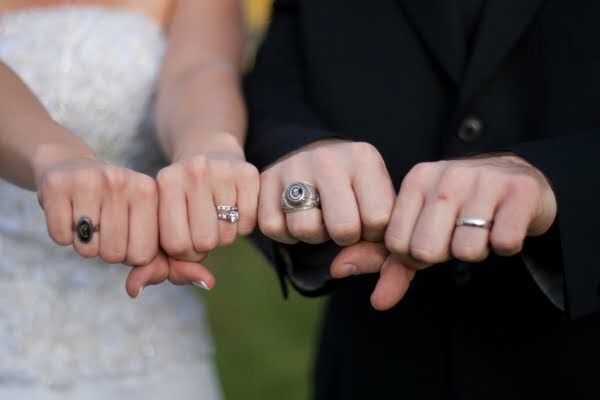 Get a photo of you and your groom's Clemson rings with your wedding rings. Read our entire post on making your Clemson rings part of your wedding day. If you get married in Clemson, have wedding photos taken in the stadium. Read Jennifer and Chad's full Clemson wedding post. Have a Clemson cake topper on your wedding cake. Read about and see photos of this Clemson Girl wedding on our blog. 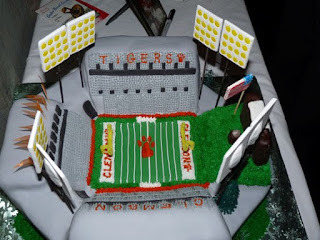 Have a Clemson-themed groom's cake. See more Clemson-themed groom's cakes and Clemson wedding details. 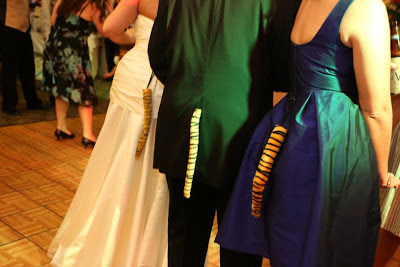 your groom, enter the reception wearing tiger tails. 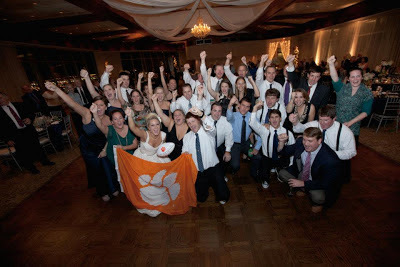 Read about and see photos of Clemson Girl Lindsey's wedding . 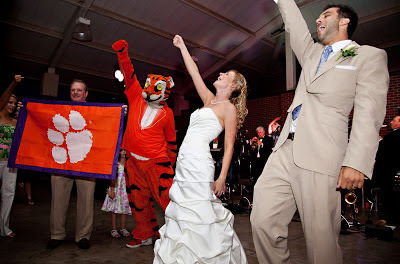 Invite the Tiger to your wedding reception, dance with him and play Tiger Rag. 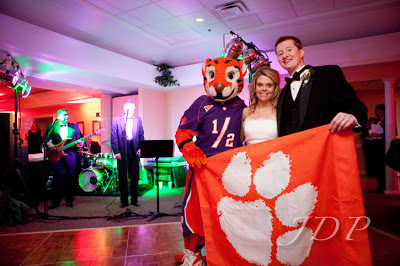 Read about and see photos of Sarah and Brent's Clemson wedding. 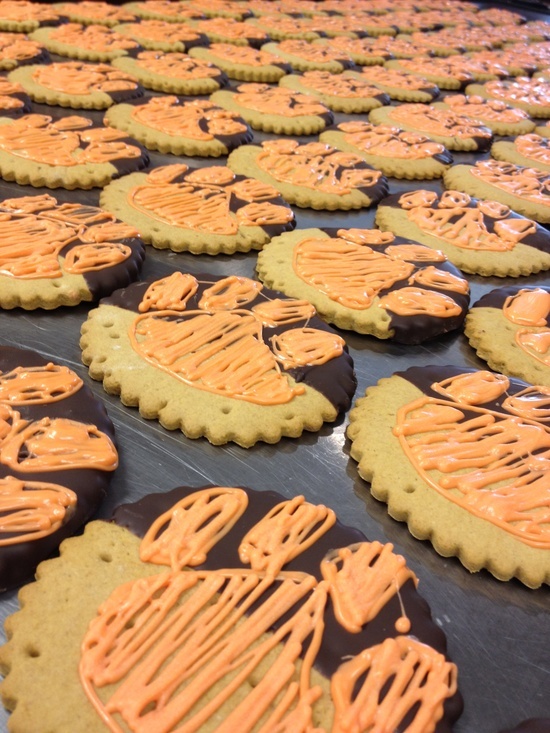 Don't forget to invite the Tiger Cub too! 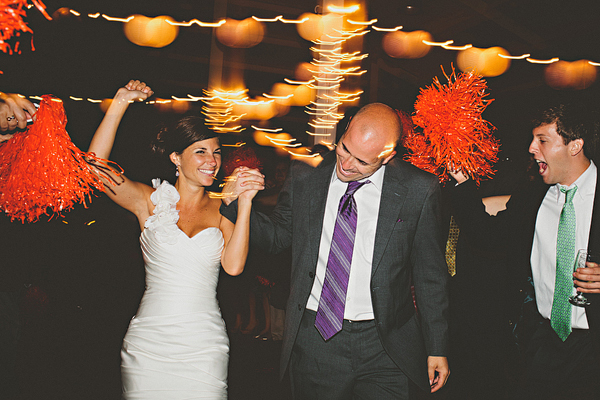 Read about and see photos of Maggie and Jonathan's Clemson wedding. your guests with a Clemson flag or tiger rag. Photo by Studio G Photography. Give your guests delicious, edible Clemson favors. 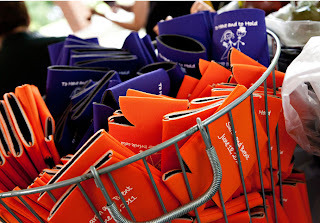 Provide your guests with fun, personalized orange and purple koozies. 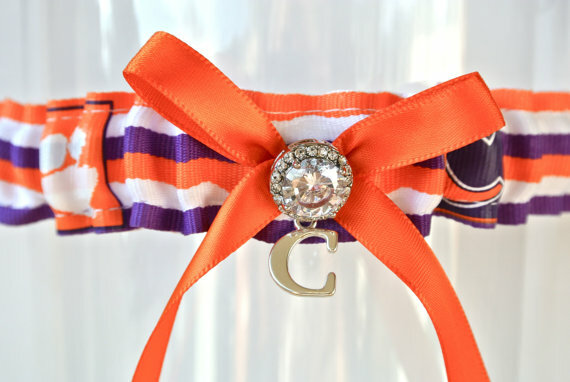 See more fun Clemson details from Maggie and Jonathan's Clemson wedding. they wave Clemson pom poms in the air. Photo by Amy Arrington Photography. 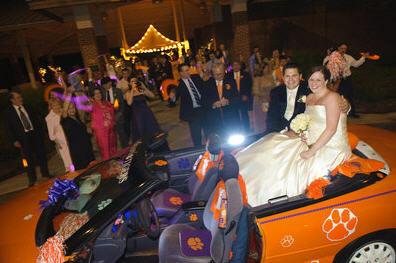 Leave the reception in a hard-to-miss Clemson getaway car. 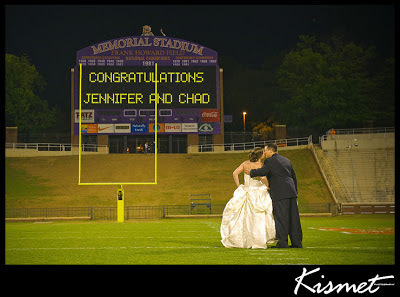 View more fun Clemson wedding details in Jennifer and Chad's wedding post. Did you have any of these fun Clemson wedding traditions in your wedding? What have we forgotten or left out? 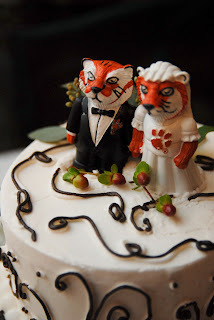 What fun Clemson details did you include (or plan to include) in your wedding? Tell us in the comments section of this post!